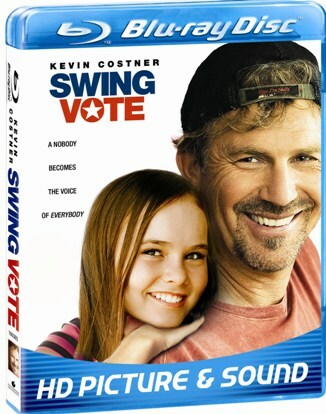 In Swing Vote, Bud Johnson (Kevin Costner) is a slacker coasting through life. His care taker is his twelve year old daughter Molly Johnson (Madeline Carroll) who runs the household. She’s the one who wakes him up in the morning and cooks all his meals. Molly even urges her dad that he has a civil responsibility to vote and that she wants him to meet her at the voting booth cause it’s election day. However, Bud gets drunk and doesn’t make it, leading Molly to trigger a series of events that lead Bud into becoming a celebrity as his vote with determine the next president. President Andrew Boone (Kelsey Grammer), the Republican incumbent and Democratic presidential hopeful Donald Greenleaf (Dennis Hopper) must now fight for the vote of not an entire nation but of a single person, Bud. While the situation that triggers the swing vote is implausible, it’s not too farfetched the extend that President Andrew Boone and Democratic nominee Donald Greenleaf are willing to go to win. The hypocrisy is best seen in two scenes that has Republican President Andrew Boone and Democratic nominee Donald Greenleaf going against key issues they believe in just to please Bud and get the winning vote. The main theme of the movie is Bud and his relationship with his daughter and how being thrown into this situation is going to make him a new man. Of course, those of us that have seen enough movies know this from the open scenes, and there are no major surprises here. While billed as a comedy, the movie got only a hand full of smiles from me. The strength of the movie is Kevin Costner who continues to deliver strong performance, but can’t seem to pick the right movie. It’s hard to find a Hollywood movie that looks bad in Blu-ray and Swing Vote is no exception. The film transfer is exceptional and pretty much free of grain. The detail in each scene is marvelous and colors look vibrant. To tell the truth, these days I’m finding it harder and harder to watch movies in standard DVD format. Since getting my new 52-inch LCD TV this past Christmas, I’ve been re-watching all my Blu-ray disc and they look even better than they did on my old HDTV rear projection television. One last thing regarding the audio; the track is done in DTS-HD and sounds decent for this type of movie. Audio levels are good without overwhelming the dialog. Audio Commentary - Audio Commentary by writer/director Joshua Michael Stern and Writer Jason Richman. Deleted & Extended Scenes with optional audio commentary by writer/director Joshua Michael Stern.The best of the lot “Fox and Crumb Change The System” has Nathan Lane’s Art Crumb and Stanley Tucci’s Martin Fox joking about running a fair campaign based on issues.